Here is another little sneak peek of a necklace that I made for this Saturday’s craft show. I’m getting so excited!! It is made with glass and metal beads. The dragonfly is metal and approximately 1 inch long. The disc behind the dragonfly is a cut sea shell. This necklace measures about 18 inches and is beautiful, if I do say so myself. 🙂 You’ll just have to see it in person. Remember, the craft show is this Saturday (June 21st) in the Walmart parking lot in Brownsburg, IN. Hope to see you there. 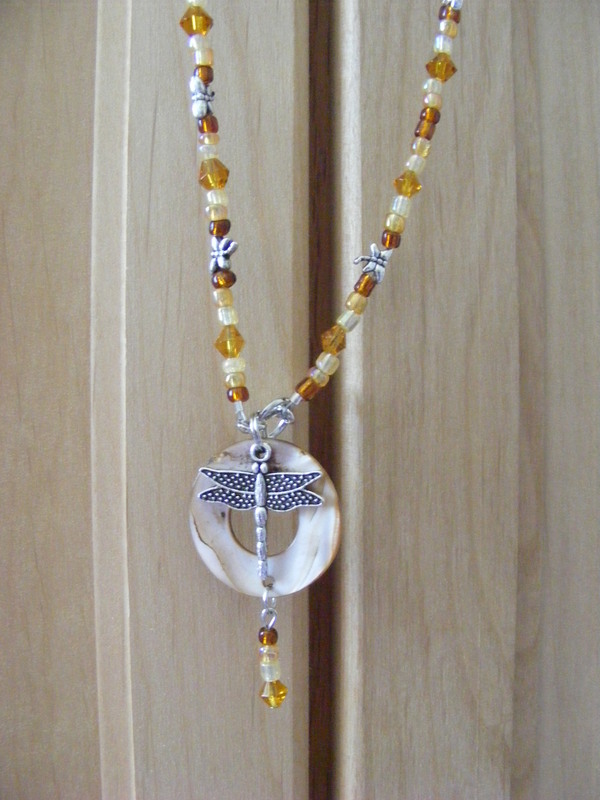 This entry was posted in Beaded Jewelry and tagged Beaded Jewelry, dragonfly, glass beads, metal beads, necklace. Bookmark the permalink.